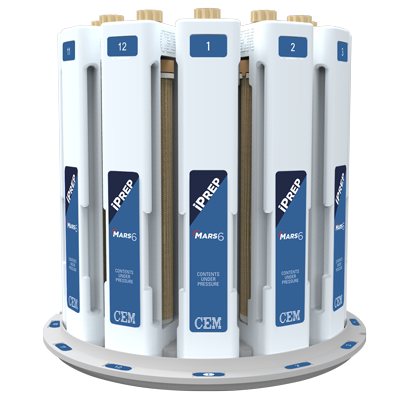 (Matthews, North Carolina) March 6, 2017- CEM Corporation, a leading supplier of sample preparation solutions, is pleased to introduce the all-new iPrep Microwave Digestion Vessel based on a revolutionary breakthrough in temperature control technology. iPrep is the first ever dual-seal vessel that requires no probes for precise temperature control while achieving digestion conditions unattained by any other vessel. “For the first time, a new disruptive technology exists that allows for complete dissolution of samples previously undigestable by microwave sample preparation,” commented Michael J. Collins, President and CEO of CEM Corporation. “iPrep also allows for twice the amount of sample to be prepared which provides for better detection limits and better sample homogeneity.” This technology will have an enormous impact on labs by eliminating sample prep as an issue even for the most difficult applications. iPrep is the easiest to use high pressure/temperature vessel available. It allows for ease of assembly, does not require temperature probes, and uses a simple hand-torque sealing device, which eliminates the need for heavy and difficult to use torque wrenches. The open architecture of the vessel allows for rapid cooling without the need for external cooling sources like water baths or chillers. The combination of iPrep and iWave temperature control will forever change the world of microwave digestion. CEM Corporation, a private company based in Matthews, North Carolina, is a leading provider of microwave laboratory instrumentation. The Company has subsidiaries in the United Kingdom, Germany, Italy, France, and Japan, as well as a global network of distributors. CEM designs and manufactures systems for life sciences, analytical laboratories and processing plants worldwide. The Company’s products are used in many industries including pharmaceutical, biotech, chemical and food processing, as well as academic research.